Finding ways to reach a target audience can get a little difficult at times. There are so many factors that need to be kept in mind, such as age, location, gender, religion, sexual orientation and much more. A message can work perfectly for one group but might be offensive or not politically correct to another. For example, the “Help me, I’m poor” meme from Bridesmaids that FAFSA tweeted on June 24. 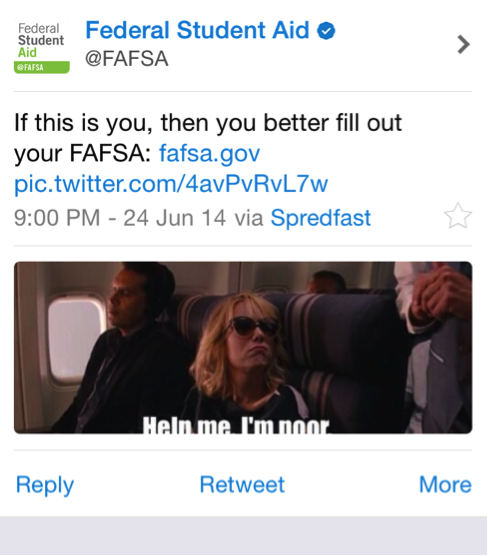 This wasn’t the first time FAFSA used a meme to reach its audience. On March 4, 2014, FAFSA tweeted a picture of a kitten with the caption “You haven’t filled out your FAFSA yet? Are you kitten me?” I think it is surprisingly out of the norm for a government office to use memes, but according to finaid.org, most FAFSA recipients are between the ages of 15 – 23, so I can see why they would think to use memes to get the audience’s attention. Liz Gross, a social media strategist for a student loan servicer explained in her blog that the hashtag #HelpMeImPoor is commonly used by students when referring to their financial struggles during college. It’s like when a person says something mean about a family member. It’s okay when they utter it about someone in their family, but it’s insensitive if someone outside of the family says it. Overall, I think FAFSA should not be condemned over one tweet. I also don’t think they should have deleted it. Deleting tweets is not a way of solving a problem since the tweet was already seen by many. FAFSA’s Twitter is full of helpful tweets and answers any questions students might have through its website and its monthly Twitter chats. The lesson here is always, emphasizing always, think before you tweet. Make sure tweets are not offensive to others because once it is public, there is no way to make it disappear. Do you think the tweet was insensitive? Tell us what you think. Like us on Facebook and follow us on Twitter!